Ruiz Cemetery Census, August 1992. Ruiz-Perea Family Cemetery: A Census, April 2001. LW2154a - Looking Up At Ruiz Cemetery, March 2002. LW2154b - Ruiz Family: Flood Victims. LW2154c - Ruiz Family: Flood Victims. GR0854 - Ruiz Family: Flood Victims. LW2154d - Rosaria Perea Ruiz, Flood Victim. LW2154e - Enrique R. "Henry" Ruiz, Flood Victim. LW2154f - Rosarita & Roland Erratchuo, Flood Victims. LW2154g - Nicanor H. "Nick" Rivera, Newhall Innkeeper. LW2154h - Niebes Ruiz, 1794-1904. LW2154i - Martin Ruiz, Newhall Innkeeper. TS1915 - Ramon (1915) & Antonia (1888) Perea. LW2154j - Constant Lebrun, 1824-1888. LP2401 - August "Gus" LeBrun, 1884-1924. GR0841 - Funeral at the Ruiz Cemetery, 1928. 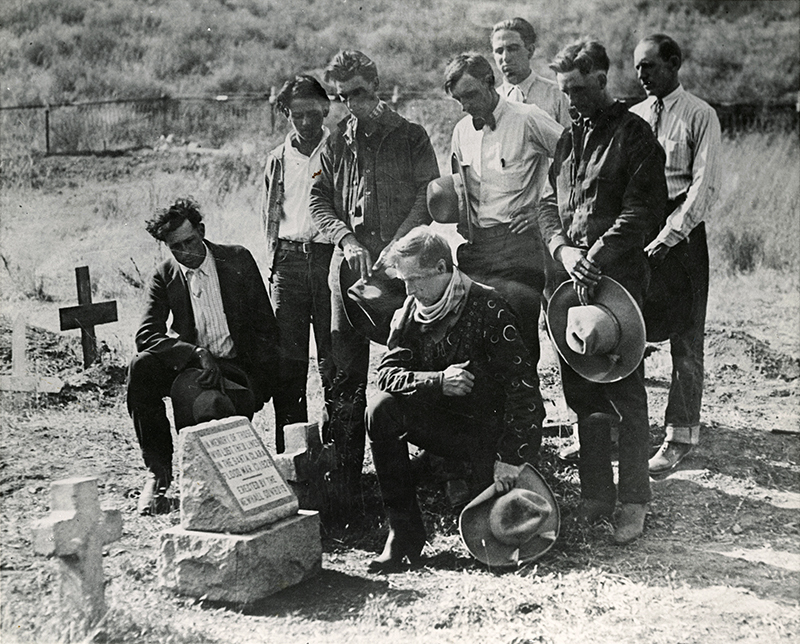 LW2077 - Newhall Cowboys Placing Dam Victim Marker, 1928. LW2154k - Newhall Cowboys' Dam Victim Marker, 2002. AP2323 - Mabel Packard Wagner at the Cemetery, 1963. AP2324 - Mabel Packard Wagner at the Cemetery, 1963. AP2325 - Mabel Packard Wagner & A.B. Perkins at the Cemetery, 1963. AP2326 - Mabel Packard Wagner at the Cemetery, 1963. AP2327 - Mabel Packard Wagner at the Cemetery, 1963. TS1964 - Harry S. Chacanaca's Grave Marker, March 2002. LW060502a - Ruiz Cemetery During Copper Fire, 6-5-2002. 10 Images. LW2430 - Fred & Frances Cooke, 7-14-2013.